On the wiring the Black wire is to the RIGHT coil and the White is to the LEFT coil. 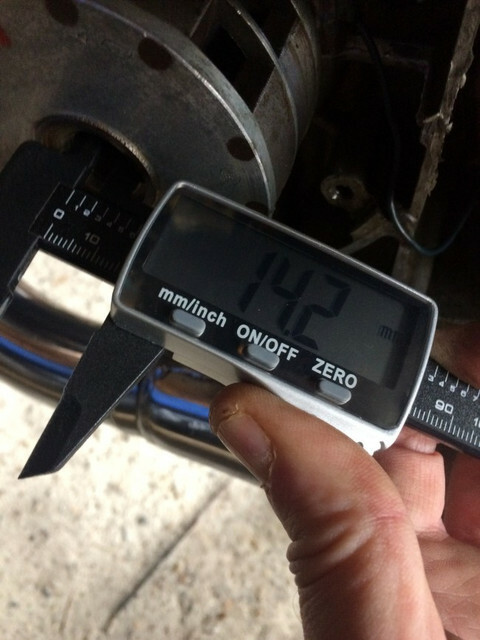 With regard to the not-fitting trigger for the new ignition system. Are you sure you have been trying to fit it the right way up? I see what looks like scuff marks around the magnets, as if someone tried to insert it the wrong way around. Is the new one the same height as the old one? Good point, but the plate should fit over the rotor, so the hole must be tiny or the rotor is oversize and maybe intended for something else. I think so. 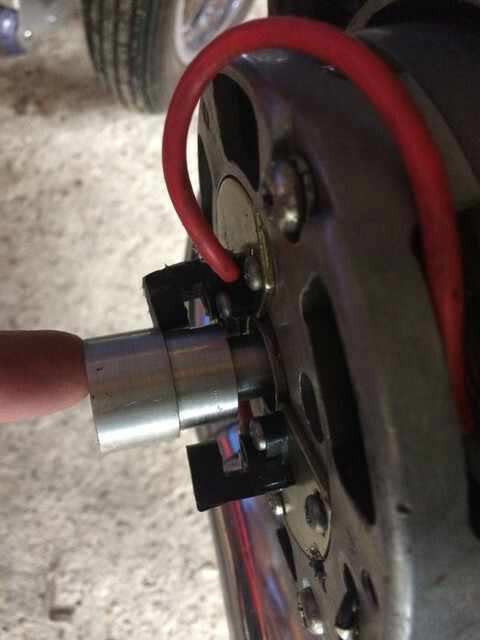 The pickup plate should be designed to mount on the outside of the alternator, so if that is gone now, you will probably have to mount it some other way. I take it from those comments that the "nose" of the new rotor is too large to fit in the matching recess in the alternator rotor. If that's teh issue, turn it down or machine up a "washer-adapter" to mate the two parts. If you are trying to bolt the new rotor directly to the crankshaft nose, that would present other difficulties but again it's just a case of making the parts match each other. 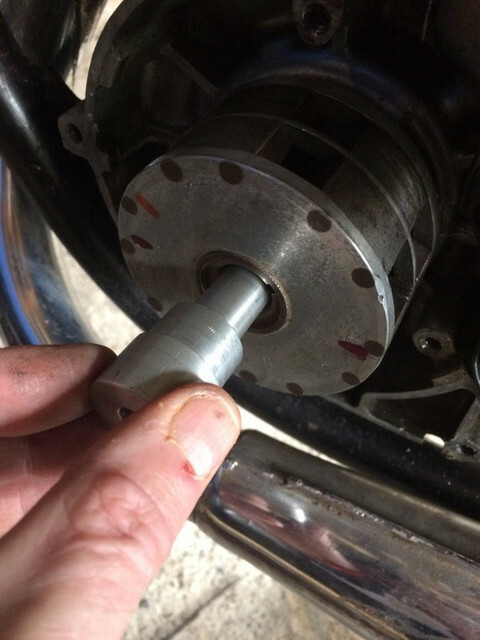 When we mount a DYNA rotor straight on the end of a Honda twin crank, either the rotor has to be machined to match the crank taper or the end of the crank has to be shortened to match the rotor. The replacement plate fits on to the alternator to replace the Newtronic one, the problem is the new shaft will not fit in to the middle hole, because the bottom of the shaft is too large for the opening. I think that I should be able to work out the wiring after reading some of the replies on here, just need to sort the shaft, and then setting up the timing. I am in discussions with the manufacturer about bits etc. Just a wild idea, but why not take a stepped drill to the backing plate to open up the hole? Just to clarify the problem is with the magneto part, not the alternator and plate part. The hole in the end of the crank shaft is too small. Once Paul is able to take some pictures I will post them up. The smaller part of the new shaft is 14.5mm in diameter, but the opening on the magneto is 14.2mm. 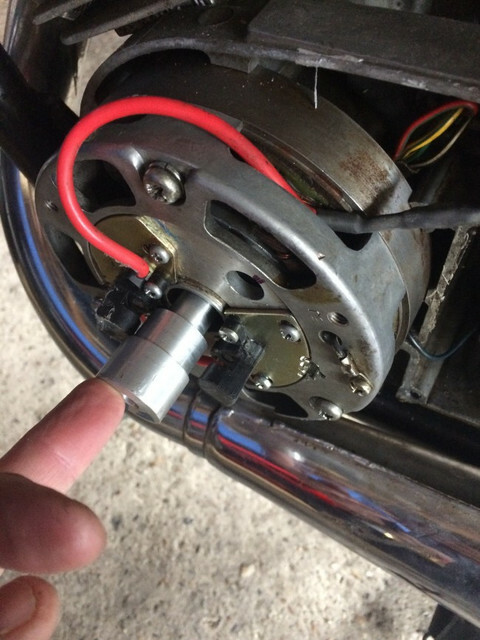 Does anyone have access to a GT250A magneto and could check the opening size, as the manufacturer is saying that they have never had a problem before? Please ignore the newtronic sensors they are what is currently on the bike, not the new sensors. I see what you are dealing with. The conversions I have done with other manufacturers ignitions, the rotor does not fit insed the threaed part of the alternatior, but sits like stock points cam in the shallow recess. That explains the long thin section on yours. Two possible solutions - make the hole bigger or make the shaft smaller. That hole is threaded to take an extractor bolt to remove the alternator. The threads may be damaged and rough. I would think that you could get a small rotary tool bit in there and gently clean the threads a little. Go slowly. You only need to remove 0.3mm off the diameter so that's 0.15mm radially - just a slight clean up. So if I run a tap or is it die ( I can never remember!) through the thread it might resolve the problem? Looks like the wrong part to me. Why put a long stem on it when it is not necessary? But hey, I could be wrong. I see. In that case it must be like TZ said, incorrect generator rotor or crappy threads stopping it from fitting into the hole. The tool you need is a tap. 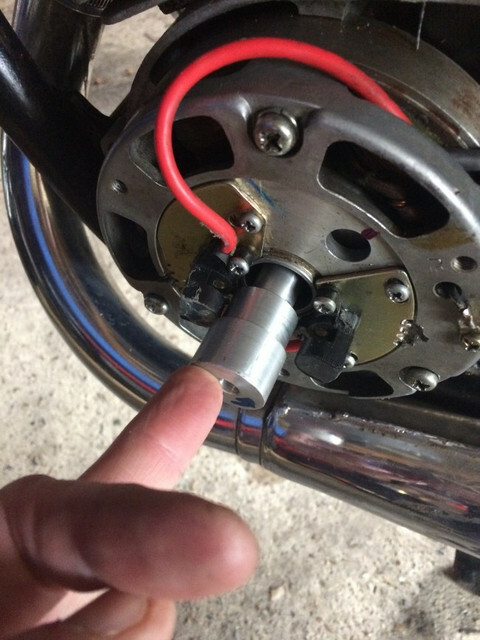 I'm not 100% sure, but you might need to remove the generator rotor to get the tap to reach the bottom of the threads. T500 stators have two different parts numbers. Could be that one of the differences is the puller threads. That's possible. We are only talking a poofteenth here. 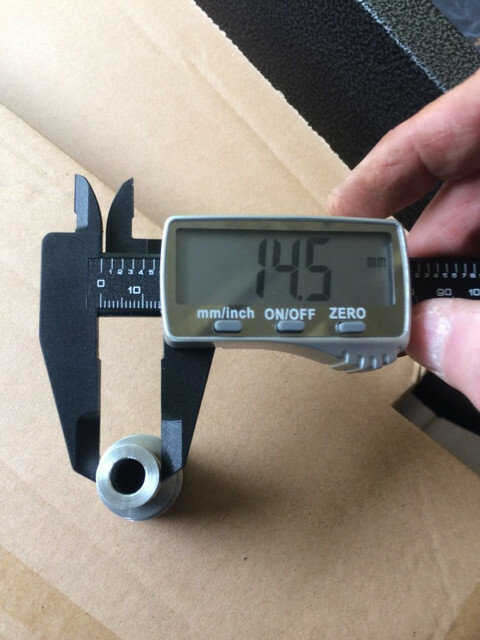 14.2 to 14.5mm. You could try to run a tap down the rotor threads but as was mentioned, take the rotor off first. Wit so little metal to remove, I'd take teh rotor off and use a sanding drum on a dremmel tool to lightly take the peaks off those threads. Don't hog it out. Only 12 thou in diameter, 6 thou radially. It's just a light touch with a sanding drum. That is a great idea for a twin cylinder DD! Shame something similar wouldn't work on a triple. That is how the PEI ignition works on the GT500. There is a single pickup & one coil with two HT leads. There have been similar systems on many cars too. It is a very good cheap ignition.